On a bleak, scorched landscape reminiscent of a nuclear testing site two big, clunky, aggressive looking boots approach the first and only green shoot that has sprouted out of the arid earth. 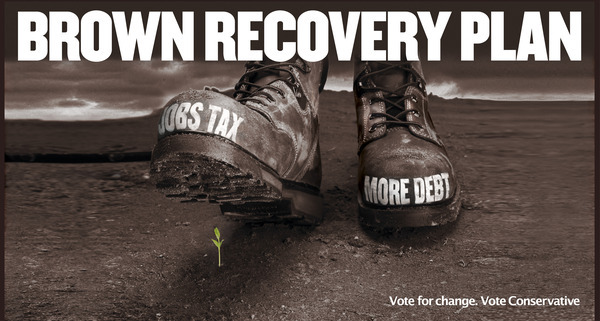 The lastest attack advert from the Conservative Party asserts that Gordon Brown’s plan to raise national insurance contributions and refusal to instigate rapid cuts in spending are a policy combination that would stamp out any hopes of economic recovery. It’s another straight talking, brutal piece of negative political advertising from the Tories. One can’t deny the visual impact of the piece and the issues addressed will doubtless be salient with those considering voting Tory on polling day.